South Korea's national security adviser today announced he told President Donald Trump that Kim Jong Un says he's committed to denuclearization, and that Trump agreed to make it happen by May, as North Korea has proposed. “He pledged that North Korea will refrain from any further nuclear or missile tests," said South Korea's Chung Eui-yong, and "President Trump would meet Kim Jong-un by May to achieve denuclearization." The South Korean envoy was reading out the announcement on behalf of the White House? Why is South Korea announcing this? Who knows. Nothing matters. No conditions specified, for now. Kim Jong Un today said he is committed to total denuclearization. 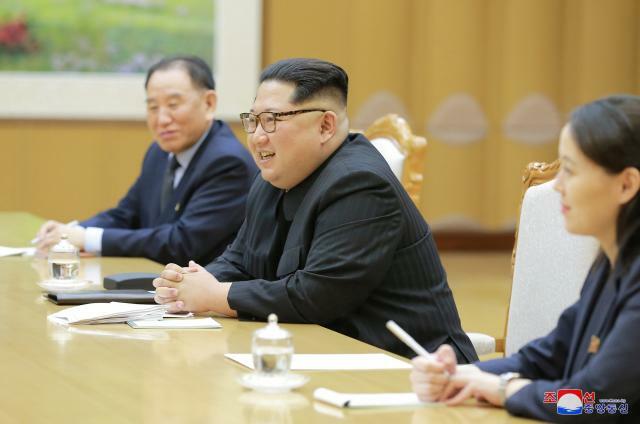 The talks will effectively freeze North Korea's nuclear program -- the reclusive leader has agreed to suspend all tests and activities while negotiations are ongoing. No sitting U.S. president has met a North Korean leader. But no North Korea leader ever had a thermonuclear ICBM. "Balance of power" attained? BREAKING: South Korean official: Donald Trump says he will meet with North Korea's Kim Jong Un by May.